Both systems will provide considerable technological and scientific advances in monitoring and predicting the Earth weather, climate, ocean, and land cover. The first stage in the history of the new polar system started on October 28, 2011 when the NPOESS Preparatory Project (NPP) satellite was launched successfully. NPP will serve as a bridge between the current polar weather satellite system and JPSS. Land-cover observations on the JPSS-NPP mission are provided by the Visible Infrared Imager Radiometer Suite (VIIRS), which has 22 bands: seven in the visible, six in the mid infrared and three in the infrared regions. 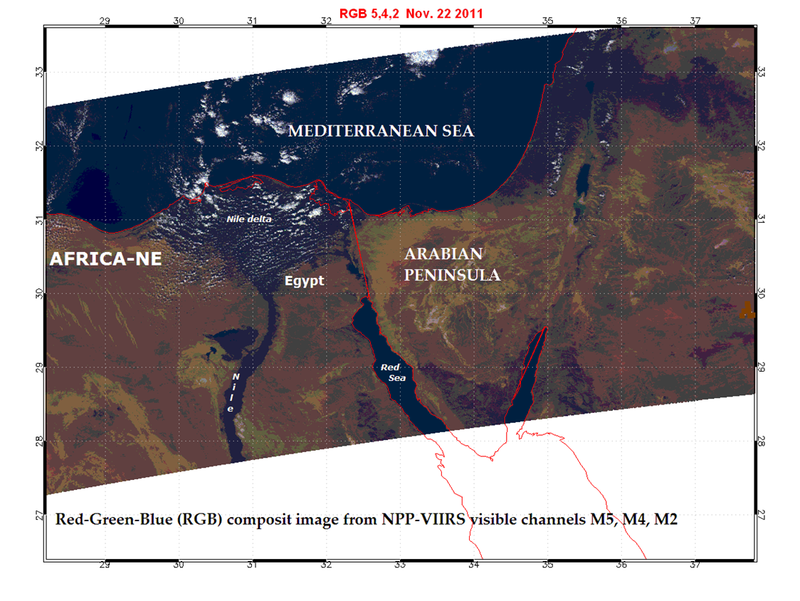 A few tiles of VIIRS observation were obtained on November 22, 2011. Three visible channels (M5 : 0.672 um, M4 : 0.555 um and M2 : 0.445 um) were used to produce red-green-blue (RGB) composite image. The image below shows southern part of Mediterranean Sea and the adjacent land. They show rightly such land, water and cloud features as Nile river and delta, Red Sea, Mediterranean Sea coast. The IDL-based high resolution coast line was used to overlay the image.